SOUTHINGTON - YMCA staff were joined by a large crowd of community supporters Wednesday as they honored exemplary residents and celebrated it 90th anniversary. The annual meeting at the Aqua Turf Club was attended by parents, teachers, Town Council members, Southington Chamber of Commerce members, members of nonprofit organizations and numerous other community stakeholders. Tables were decorated with YMCA Camp Sloper history books and wooden tents made by kids at the YMCA’s after school programs. They were decorated with things they liked about the Y, including “hike,” “smile,” and “fun.” Binders were also laid out on tables with newspaper articles and photos from the Y over the past 90 years. There was also a stage show featuring “The Greatest Gifts of 1949” these included Rudolf the Red Nosed Reindeer, a minimum wage increase, the Mercury 8 Car, the local YMCA installing a bowling alley, the Yankees winning the World Series, the birth of YMCA staff member Nancy Bauman, the birth of Billy Joel, the invention of silly putty, and the donation of the land that would become YMCA Camp Sloper to the Y in Cornelia Sloper Neal’s will. YMCA CEO Mark Pooler and the YMCA Board President Dan Daigle welcomed the guests. Sarah McAuliffe, a junior at St. Paul Catholic High School and one of the Youth Leadership Award recipients, then spoke about how the YMCA has helped her to grow as a person. McAuliffe said that she and her family have volunteered at the Y for many years. She has helped out with the annual Race4Chase and worked her first year as a counselor at YMCA Camp Sloper last summer. The other Youth Leadership Award recipient was Caitlin Mulligan. “I work hard at the Y and do a lot of volunteering over the holidays and during the Apple Harvest Festival and I close three times a week. I’ve had a lot of good experiences,” Mulligan said. 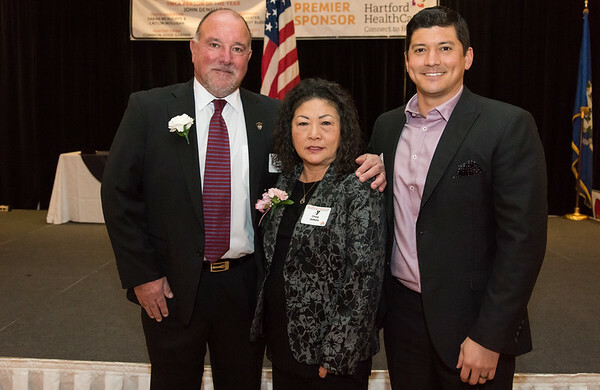 John DeMello Sr. was named the Y’s Person of the Year for years of service to local veterans. A longtime member of the Veterans Committee, DeMello and his team work to make sure veterans know what resources are available to help them and how they can access them. Youth development awards were presented to Best Buddies, Unified Theater and Unified Sports. Susan Albert, Natalie Foligno, Kate Barner, Josh Maccione and Michal Maino accepted the award for Best Buddies. Maccione explained that it is a friendship club at Southington High School which has been running for 15 years. It gives students of all ages, with and without disabilities, a chance to play games, go to sporting events together and have fun socializing. Marguerite Maddalena, head coach of Unified Sports, said she founded the program 13 years ago. It sees students with and without disabilities playing soccer and basketball, bowling and doing track and field together. About 100 students participate each year. St. Paul’s Common Good Garden received the Healthy Living Award. Rev. Suzannah Rohman, Christie Kuriger and Paula Leibowicz were there to accept it. “The garden, which is in its third year, grows vegetables to help Bread For Life prepare hot meals and deliver them to the homebound,” said Rohman. Fancy Bagels was given the Social Responsibility Award. Jackie Gaultieri of Fancy Bagels accepted the award along with her son, Dominick Gaultieri, who co-owns Fancy Bagels with Sal Becaro. She said Fancy Bagels, which has been in town for 30 years, has done fundraisers for local sports teams, drama clubs, veterans and more. Posted in The Bristol Press, General News, Southington Herald on Wednesday, 6 February 2019 20:40. Updated: Wednesday, 6 February 2019 20:43.